Every year our good friends host a really fun Super Bowl party at their home and every year my husband cooks his famous hot chicken wings. He has been doing this for the party for the past three years or so and everyone at the party just raves about his wings. This year I unintentionally stole some of his thunder with one of my very own recipes. Lets just say that when his wings were served they weren’t the only food dish that people were talking about. I don’t know if he would admit it but I’m pretty sure he was a little jealous of my dish. For once it wasn’t all about his hot wings! This year he had to share the stage or should I say table with my new recipe for the viral Low-Carb Cloud Bread that millions of people were talking about AND new delicious green sauce. 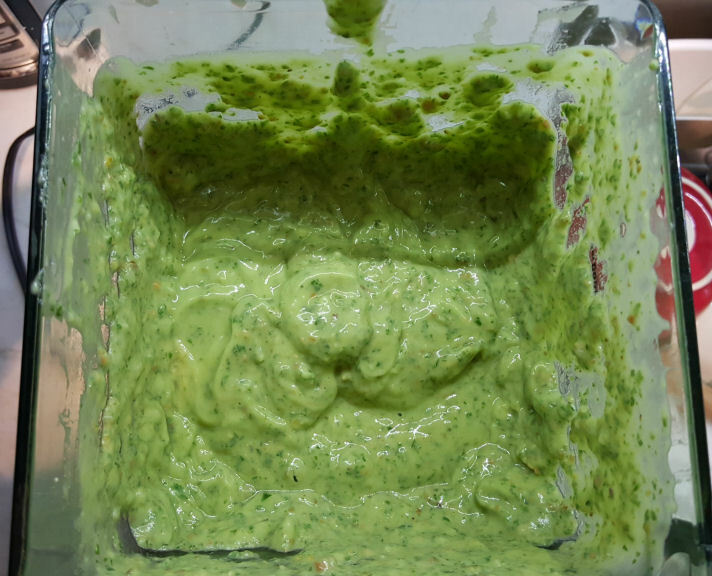 I found the green sauce recipe on Pinterest and they named it the “Secret Sauce”. Well.. once you share the secret sauce and it’s ingredients it doesn’t become “secret” any more, but let me tell you … it really stole the party. All my friends at the party were raving how delicious the sauce was and everyone wanted to know what is in it? 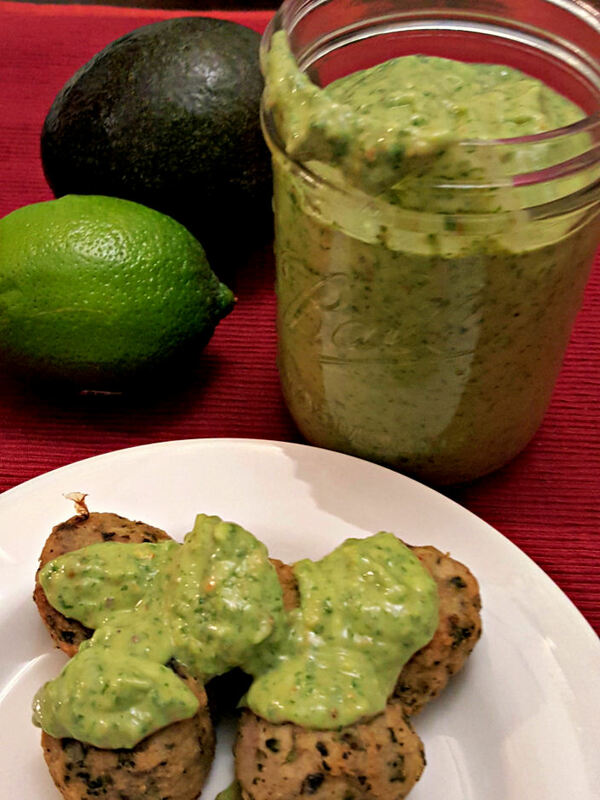 Well let me tell you this sauce is low carb, it is vegan, gluten free, it has the most ridiculously simplest ingredients and it is SO POWERFUL, HEALTHY, it bursts with flavor and nutritious vitamins are practically jumping in your belly and your body says: Thank you for feeding me this AwesomeSauce! Definitely a Superfood. 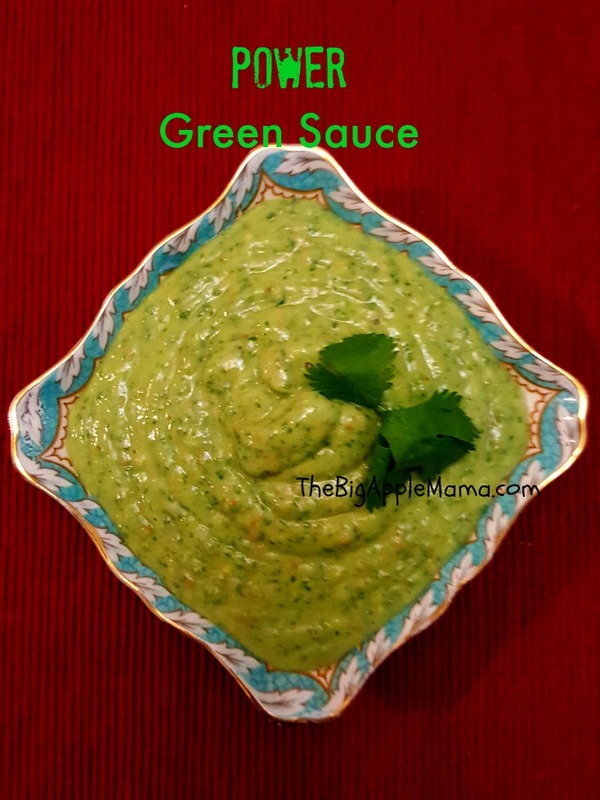 My favorite part about this sauce is that not only it has the most healthiest ingredients on the planet, it can be served as a spread, as a sauce, as a dip and most importantly it only takes 5 minutes to make from start to finish. Ok enough baloney, here’s a list of ingredients and instructions on how to make this delicious sauce that will have your guests raving at your next party. I also made the video with my 9 y.o. helping to demonstrate how to make the sauce! 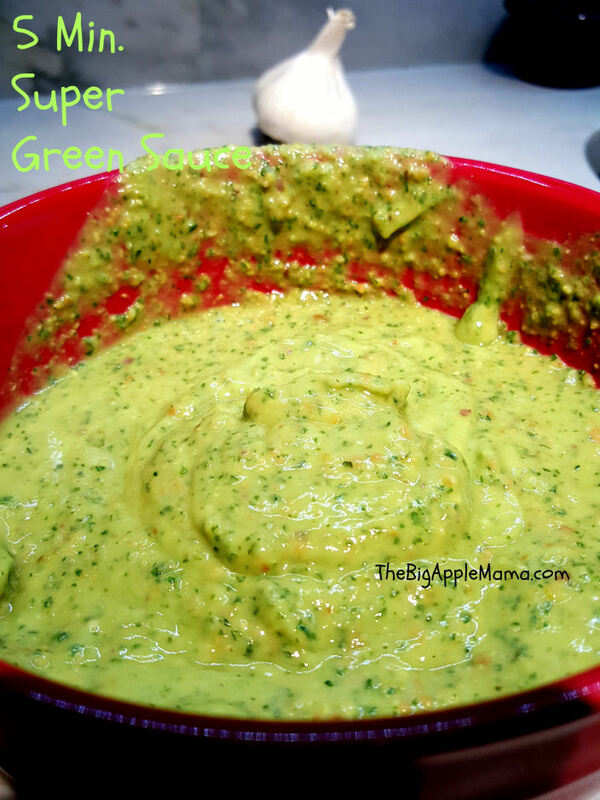 I called the green sauce “Super Mama Green Sauce” because my friends chipped in and helped me name it this way. Put all the ingredients (except nuts) into your blender. Blend it. Blend it good for about 1 minute. Then add the nuts and blend it again for another minute. That’s it. You’re done! Done! The sauce is done! 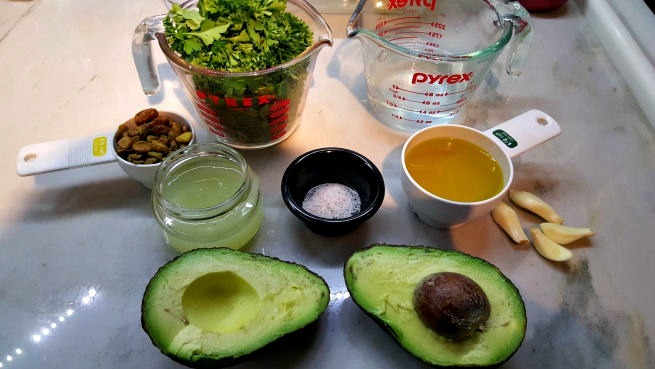 Pour the sauce from the blender into a bowl and start enjoying it while it’s fresh and bursting with flavor and vitamins. Pour the sauce over meatballs. It is divine over chicken, it is so awesome over a steak, over a fish or serve it as a dip for a veggies. I even loved this sauce as a dip for my wings mixed with a little bit with the blue cheese dressing. Yummy! Store the sauce in the ceramic bowl or a glass jar in the refrigerator, covered. It is even better the second day because the sauce gets thicker. Because the ingredients are so fresh I recommend to eat the sauce within a day or 2 but you can store it in the refrigerator up to 3-4 days. Try it! Let me know how you were loving the green sauce? I would love to know. And your feedback of course! With Yummly, once you press on this button at the top of this post, you can save this recipes from this page or from any website and look them up quickly and easily. It will be saved to your Yummly recipe box. Yummly will also be sending a recipe recommendations just for you and a smart shopping list. While similar to Pinterest, Yummly gives you additional tools to organize, sort and search for recipes. So please give it a “YUM” and hopefully you will Yum my other recipes from my Yummly recipe box. Note, I’m new on Yummly so I just started adding the recipes. « Our Adventure at Kalahari Resort and Water Park, PA + A Giveaway! Hi there Irina, thanks a lot for sharing your recipe and a delicacy that made someone really jealous (If I was him I would have started a fight) LOL. it must taste heaven. I will surely be making this one of these weekends, it sounds pretty easy to make. Thanks for the easy steps too. Wow this looks incredible!! I can not wait to try it! I live alone and wouldn’t be able to use the entire recipe in 3-4 days. Could it be frozen?